Lately I’ve been talking with a lot of people about what they will be planting this year. Everyone has their favorite herbs in their gardens. Some folks plant flowers for beauty and to attract birds and pollinators, some want herbs to add flavor in their cooking. As an herbalist, I’m always looking for not only beauty and taste, but medicine as well. 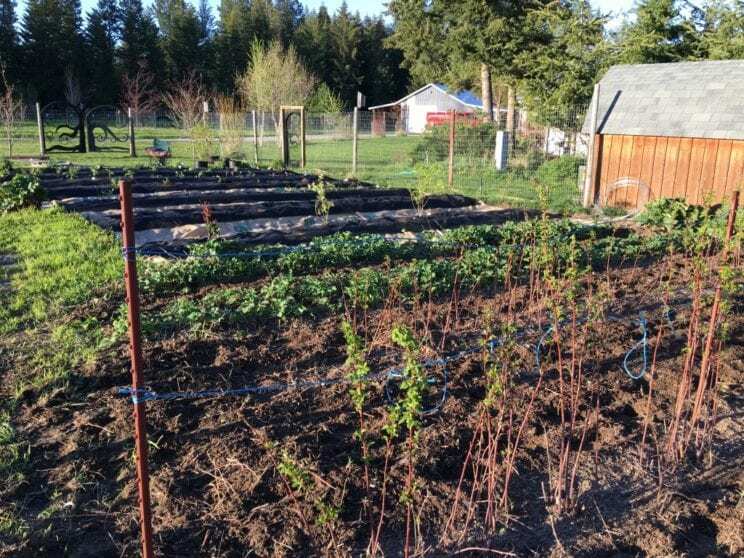 I recently acquired a 20×20 plot in a community garden at 21 Acres Farm in Woodinville, Wa as I cannot garden in my current home. I am soooo excited to get plants that are in huge pots in the ground! Bringing them over, deciding who best lives near whom, putting hands, knees, and probably face in the soil is so thrilling to me! The plants will get to stretch out their roots and be healthier for it. My little plot will surely be bursting with life from stem to stern. 20×20 is small! Still, I’ll take what I can get until we make our move to Idaho. Did you know that most of our common tasty herbs are medicinal? Here’s a list of a few of my personal favorites that are always in my garden. Perhaps they’re your favorites as well. Or perhaps, you’ll want to add these to your little slice of heaven! Fennel: Foeniculum vulgare. Fennel is a hardy perennial. 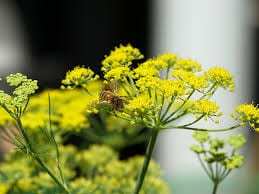 It grows to 4-8 feet tall, has feathery looking leaves and clusters of yellow flowers. It needs a fair amount of room as it will send plants up from the ground via the roots. All parts of the plant taste like anise. It makes a brilliant butterfly- and bee-attracting addition to any garden. I use the leaves and flowers in summer salads and make an oxymel each year for micronutrient-packed shrubs. In the late summer, I gather the seeds to make an elixir for use as a carminative. Carminative herbs help to dispel gas from the body. Yay team! Breastfeeding mamas can eat fennel to help relieve their baby’s gas pains. I love planting calendula around fennel. They are friendly companions in both beauty and pollinator attraction. 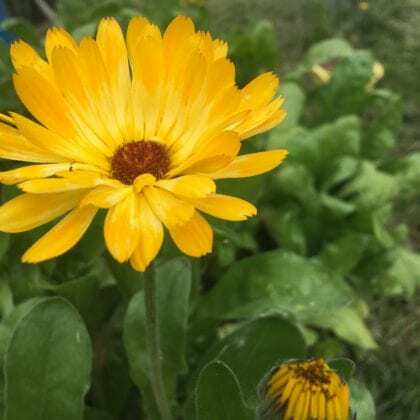 Calendula: Calendula officinalis. A medicinal oil or witch hazel extract of the flowers applied to the skin help reduce the pain and inflammation of wounds, particularly slow-healing wounds. The medicine is powerful yet gentle. It’s helpful in treating hemorrhoids, varicose veins, eczema and psoriasis. 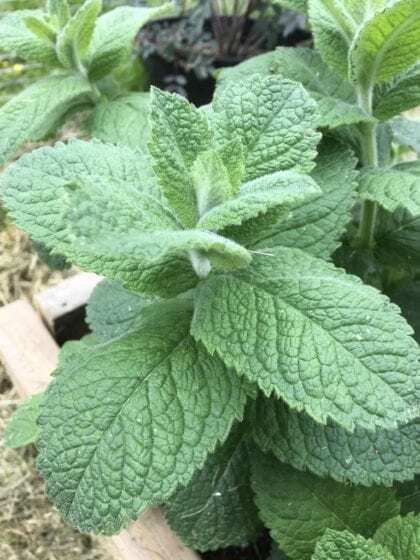 This is the herb I used in a salve along with comfrey to help prevent skin irritation and soothe my mom’s skin during her chemo and radiation treatments. Her doctor and nurses were amazed at how healthy her skin stayed through it all. Comfrey: Symphytum officinale. Comfrey has a bad rap as a plant that spreads like wildfire. In my experience, it doesn’t spread that much unless it’s tilled; bits of root stay on the blades, which deposit them in other parts of the garden or property. 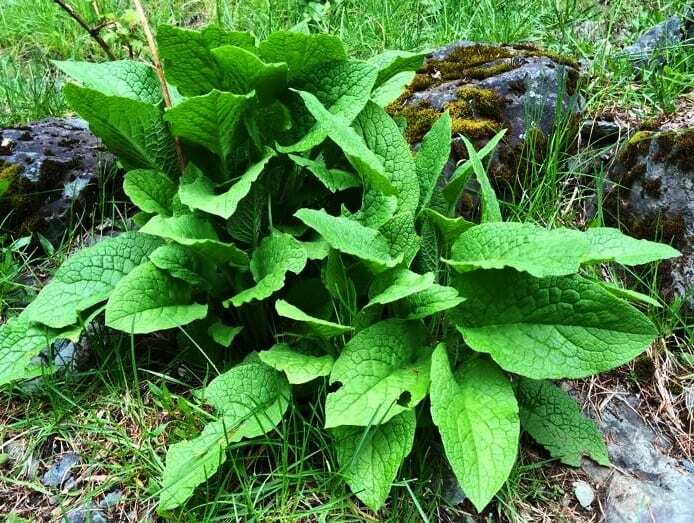 Comfrey is one of my favorite go-to herbs since it heals all soft tissue. That means skin, ligaments, tendons, and muscles. 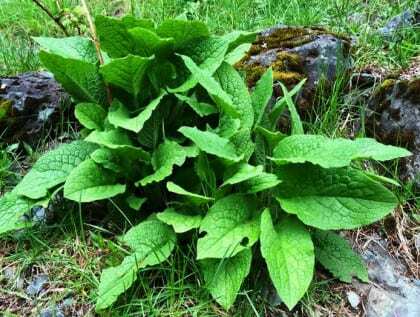 Comfrey contains a chemical called allantoin. Allantoin is used in shampoos, conditioners, and other bath and body products as a superb moisturizer and skin protector. The stems of comfrey contain more allantoin than the leaves. 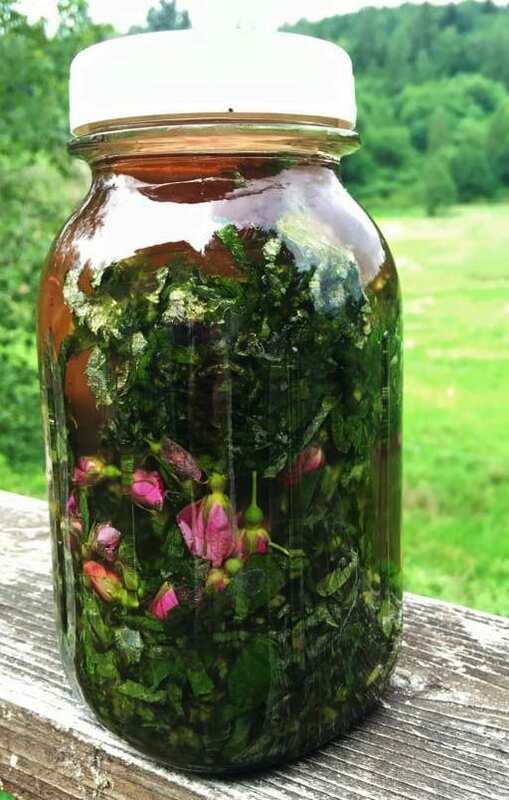 When I make a comfrey/calendula salve, I use mostly the thick stems for the best medicine with some leaves thrown in for a nice green color. I plant comfrey in all my hugelkultur beds and cut it back several times a year. It has the delightful ability to pull minerals from deep in the soil and bring them up into the leaves. As the plant is cut and left in the garden to decompose, the minerals are deposited to the top layer of the soil for all the plants to utilize. Next to my comfrey patch is my mint patch. Mints: all varieties of mints contain a surprising amount of micronutrients including the muscle and nerve relaxing trifecta calcium, potassium and iron. I have spearmint growing that I dug out of my Great Aunt Mary’s garden years ago. She passed away almost a decade ago, a week shy of her 100th birthday. She is the wonderful lady who started me on my herbal adventure when I was a little girl. I owe my livelihood and love of plants to her mentoring. The stock of spearmint I dug up from her garden is over 70 years old. I bring starts of it wherever I move, and give roots to my apprentices to grow in their gardens. One of my favorite things to do with my Aunt Mary’s spearmint is to crush a few sprigs in my lemonade in the summer. Steeping for just a few minutes releases the incredibly fresh taste and nutritionally vibrant nutrients. The vitamins C and B complexes and bioflavonoids are lost in drying and cooking, so I try to use my herbs fresh whenever possible. Bioflavonoids are antioxidants found in plants. They are the natural pigments that give fruits and vegetables their color. They can prevent permanent damage caused by the oxidative effects of free radicals, and increase the possibilities of good cellular recovery. Bioflavonoids are capable of increasing bodily health by supporting strong cell formation, which also contributes to cardiac and eye health. Bioflavonoids have anti-allergic, anti-inflammatory, anti-mutagenic, anti-carcinogenic, and anti-microbial effects. One of my favorite ways to preserve the bioflavonoids in plants is to make herbal honeys. Mint-infused local honey is a crowd pleaser! The honey can be used in raw foods, on toast, drizzled over yogurt; the list is as long as you want to make it! Rosemary: Rosmarinus officinalis. Rosemary’s medicine is epic! It is antibacterial, antifungal, and antiviral. It is an aromatic herb that, when ingested, is excreted through the lungs. That means that its medicine goes right where it’s needed when a person is congested and/or has a sinus infection. It helps to disinfect the lungs, open up the bronchia, and get the junk out! 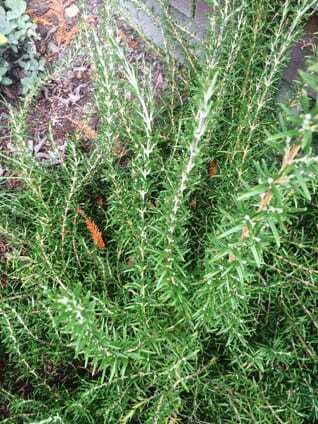 Rosemary is also antifungal. A foot soak in diluted rosemary vinegar is an excellent remedy for athlete’s foot. 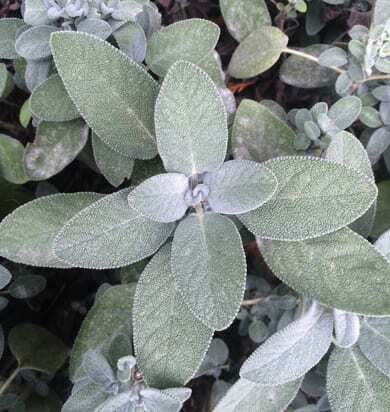 Common garden sage, Salvia officinalis, thyme, Thymus spp., and oregano, Origanum vulgare, all embody the same medicine. That’s good news! Did you know that you can make a witch hazel tincture of these herbs for a facial toner that is beneficial for all skin types? Bee Balm: Monarda fistulosa. We need to plant herbs that feed the bees. Bee balm is an attractive perennial in the mint family that lives up to its name. Bees love it! Bee balm leaves have a very spicy, pungent odor and taste. It’s one of my favorite go-to plants for its antiviral medicine. An oxymel made from bee balm is good to have on hand any time of year. Got ringing in the ears? 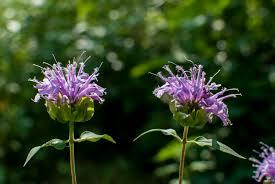 Try bee balm. Vertigo? Bee balm may be your answer. Chives: Allium schoenoprasum. 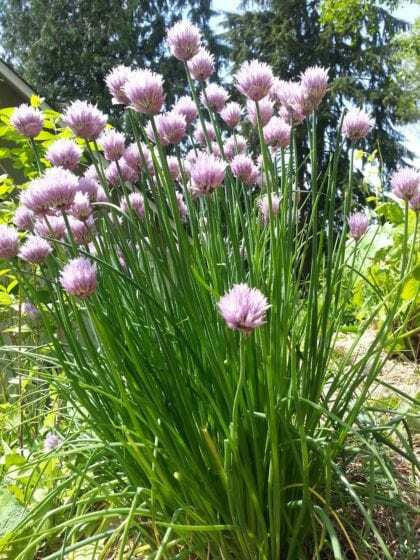 Chives are a beautiful eye-catching plant in any garden. They’re not just a pretty face but are full of medicine. Chives contain decongestant, antibacterial, and antiviral properties. The organosulfur compounds within their cells have been shown to inhibit cancer cell proliferation and tumor growth. Chives have a protective effect against some cancers including stomach, esophageal, and prostate. What the Heck is an Oxymel? I’ve thrown out a lot of medicinal remedy terms: elixir, oxymel, witch hazel tincture, herb-infused honey, and shrub. But what are these, and how do we make them? An elixir is made with equal parts brandy and honey. An oxymel is made with equal parts apple cider vinegar and honey. With both remedies, you get the medicine AND the nutrients of the plants. Simply cut the plant up as fine as possible (you’ll get stronger medicine this way), loosely pack a jar three-quarters of the way full. Add your brandy and honey for the elixir, or ACV and honey for the oxymels. Fill the jar up to the top with the liquids, put on a lid, let it sit for 3 weeks, and strain. To make a witch hazel tincture, cut the herb and fill the jar as with the elixir, then fill the jar with witch hazel. Let it sit for 3 weeks, then strain. Herbal witch hazel tinctures pull the medicine only from a plant and are solely for external use. For an herbally-infused honey, fill your jar three quarters of the way with your minced herbs, fill the jar with honey, and let it sit for a month. In order to strain the herbs from the honey, you’ll need to place the jar with the lid on in a pan of water. Heat the water until it’s steaming, then turn the heat down to medium low. Let the honey sit in this hot water for about 10-15 minutes until the honey is thin and pourable. Strain and enjoy! Honey pulls out the medicine and micronutrients of the plans and preserves them for long term. A shrub is a bit of your oxymel in fizzy water. It’s a tasty medicinal treat that everyone will love! Hungry for more? Visit Cedar Mountain Herb School for community workshops, wildcrafting intensives, and apprenticeship programs. www.cedarmountainherbs.com. Until next time, I leave you (with a big spring smile on my face!) as always, Wild About Plants!!! !